Back to Basics: How to Gather Fabric - Peek-a-Boo Pages - Patterns, Fabric & More! 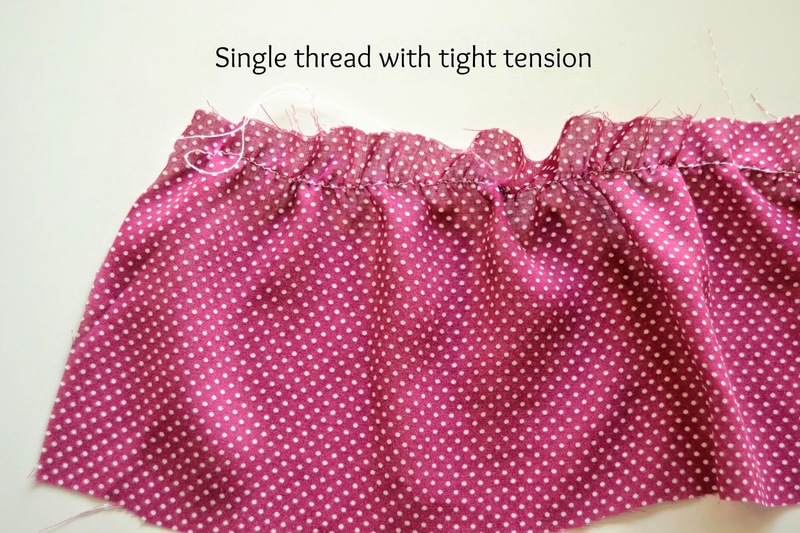 If you are used to sew pretty girl dresses for the DD and other sweet girls in your life you must have certainly come across a gathering step at some point. I mean, almost every dress pattern requests for some gathering or ruffles. Actually gathered fabric can be used for ruffles and frills in tees, blouses, jackets and coats, it adds fullness to sleeves, and interest to pillows and aprons. There are several ways to gather and everyone seems to have a favorite. For some home seamstresses gathering is easy-peasy whilst for some it is a very intimidating step. Making those gathers to look perfectly even may be a nerve-wracking job sometimes… But it doesn’t have to be! 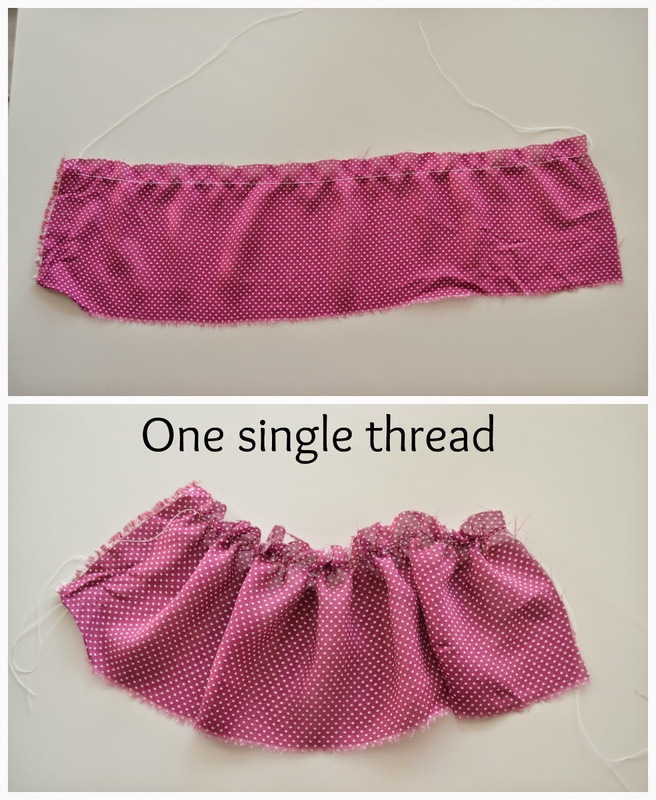 Gathering is in fact one of the most basic and simple sewing techniques. We are going to look at a few different ways to gather fabric! Set your machine to the longest length (a 4 or 5, it is called a basting stitch). Sew a straight line all the way down parallel to the edge of the fabric . Make sure to leave long tails at the beginning and end. Do not back stitch on both ends! 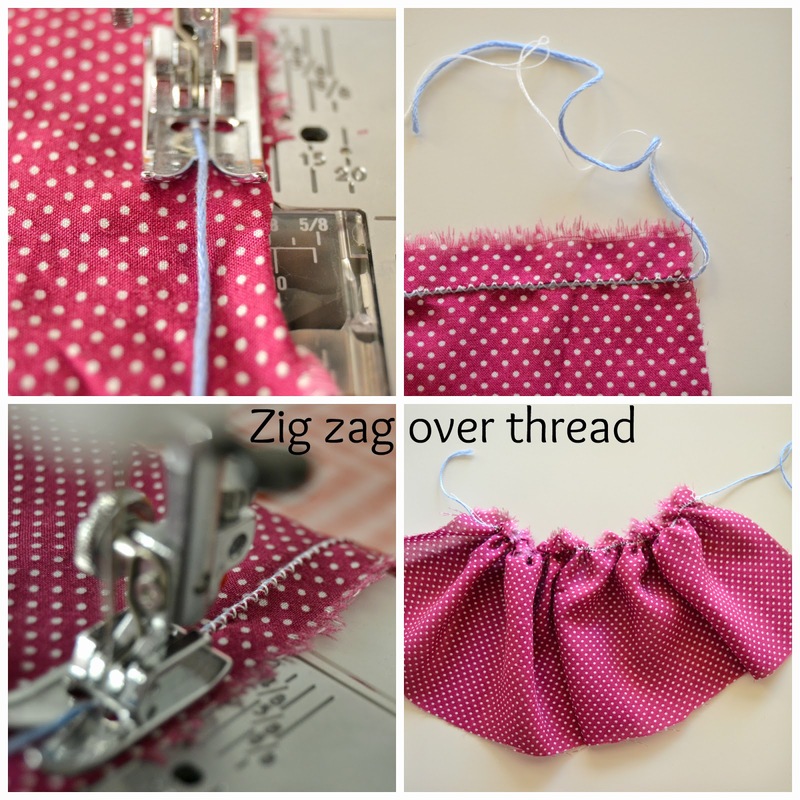 Pull the bobbin thread – hold the fabric on one end and pull from the other. If it is a long length then pull from one end to the middle and then pull from the other end. Adjust the gathers. Tie the threads on both ends so the gathering will stay. You’re done! Set your machine for the greatest length number (usually 5) and for tension 9/10 (note: do not change the tension on the bobbin thread). Sew a basting line with these settings and your fabric will gather on its own as you sew. Wonderful, isn’t it? This works wonders for light weight fabric and it’s the greatest method for making lots of ruffled stripes (fabric or paper) in a short time. This is not the best method if you need an exact measurement since you can’t control the amount of gathering. I would say this is the method most seen in PDF patterns. It works just like method #1 (one straight line) but two lines are sewn instead of one. Sew a second line of stitches parallel to the first one. Hold the threads on one end with a pin by tying them as an 8 around the pin. Pull the two bobbin threads. Smooth out the gathers from that end to the center until they are even. Tie the threads. Repeat on the other end. 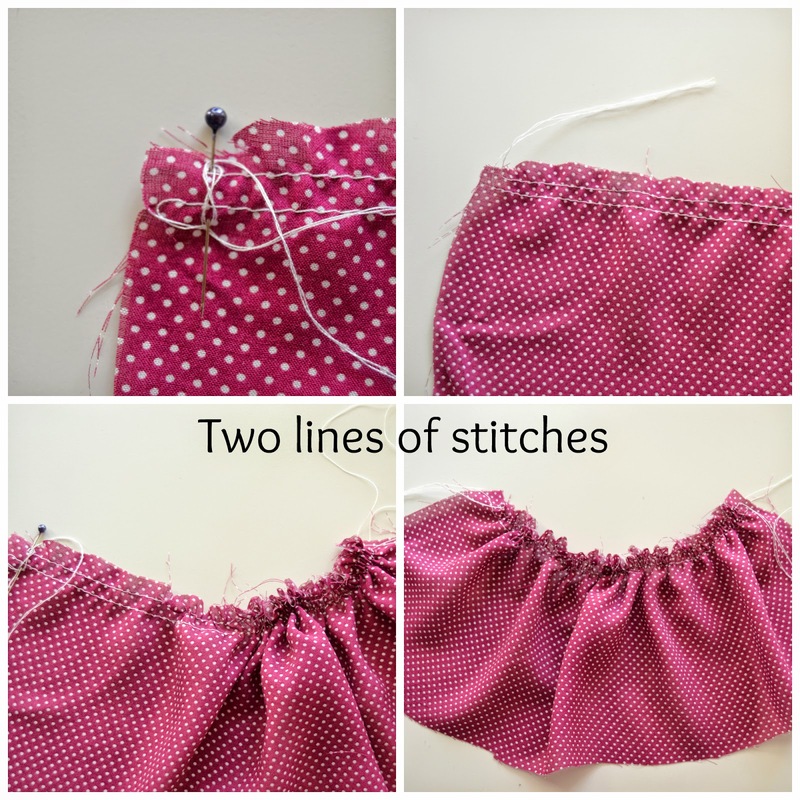 When sewing this piece of gathered fabric in place – like sewing a gathered skirt to a bodice – make sure to sew with the gathers on top and go slowly, adjusting them with your fingers or carefully with the tip of the seam ripper. You can sew this piece to the garment with both gathering stitches inside the seam allowance (SA) or by sewing it with one of the gathering stitches outside the SA. The latter is more likely to result in nicer and more even gathers. This may be the most proper way to make a gather since it produces the most even and perfect gather of all methods by preventing the gathers from shifting while sewing. Sew two basting lines just as on method #3 and then add a third row of stitches parallel to the other two. Depending on your seam allowance you can make the stitching lines parallel by 1/4” or 1/8”. Sew this piece of gathered fabric to a garment by stitching between the second and third rows of gathering. Once it is securely sewn in you can unpick the third row. Hold the fabric and pull the cord/string. The fabric will gather perfectly! This method is great for ticker fabrics since there are no chance of breaking any threads and having to start all over. I use this method when gathering tweed or corduroy. 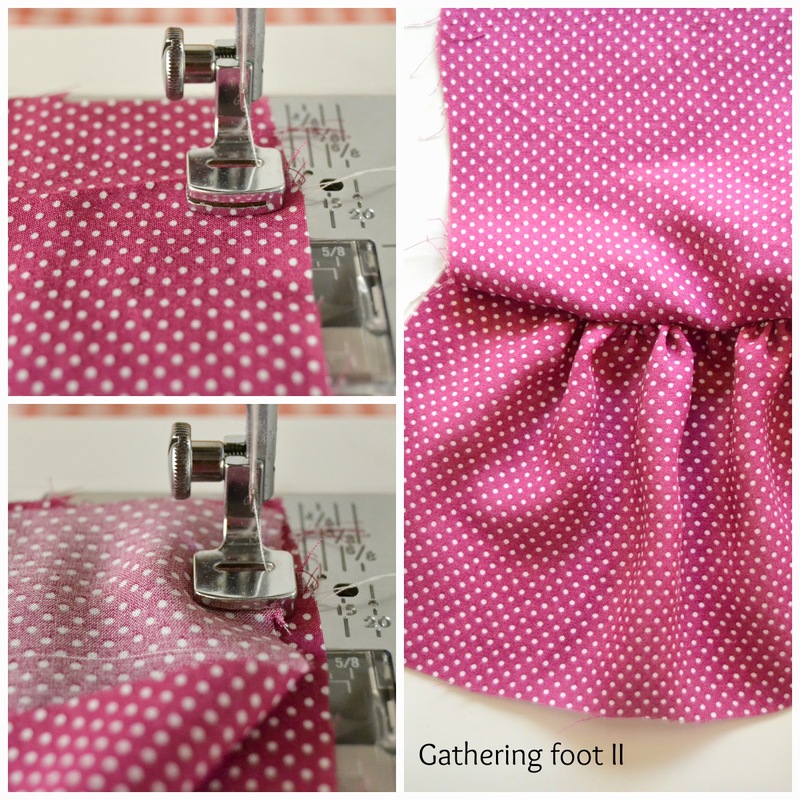 Attach your gathering foot to your sewing machine. Set to the higher stitch length. Place the fabric underneath the gathering foot and sew. The fabric will gather on its own while you sew. You can also use this foot to gather a piece of fabric while attaching it to a piece of non-gathered fabric at the same time! You just have to add the second piece of fabric (the one that will stay unruffled) in the foot’s slot (see image), right sides facing, and sew. Note: make sure the upper piece of fabric (the unruffled one) stays in place (inside the slot) while you are sewing. This method works by using a tight tension. Set the differential feed to number 2 and the length to the biggest number (4 or 5). Again, if you need an exact measurement of gathered fabric this may not be the best method. 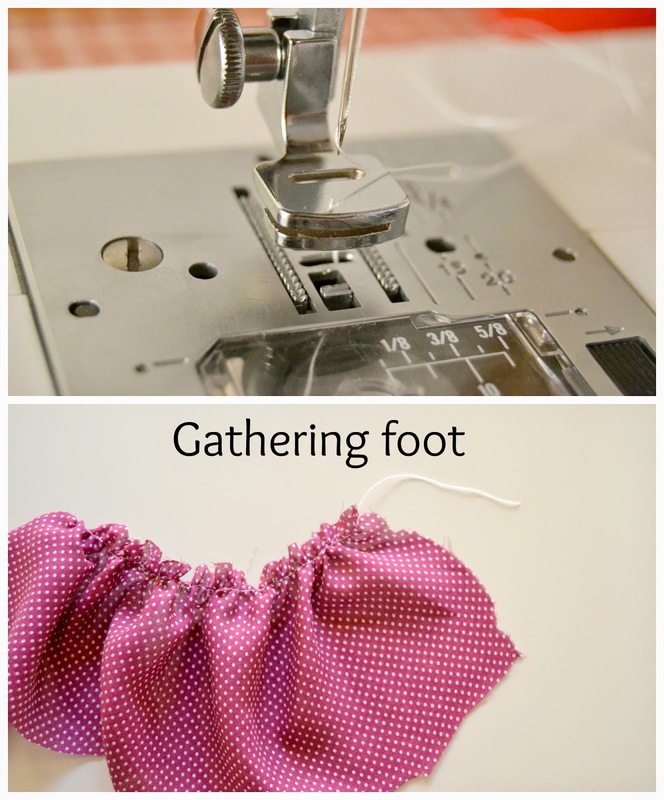 You can also use a gathering foot for sergers too, like in #6. This one takes a bit of hard work (and some math) but it is worth it. Have you used it? What are your thoughts? Shall I get one? 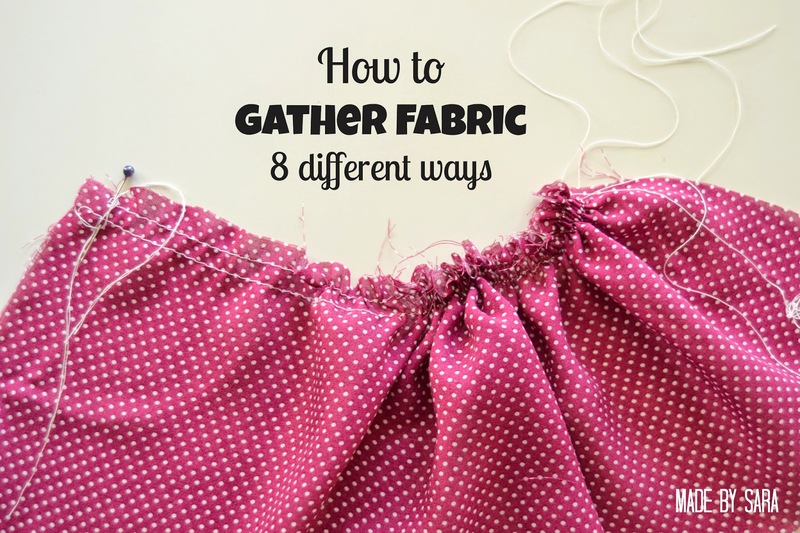 I am not sure if these are all the methods there are for gathering fabric and making pretty ruffles, but they are all I know of. Some are the “easy” methods and some are the “right” methods, but in the end most of them produce similar results. Did you knew them all? Have I missed any? (Please let me know!) What’s your favorite? Mine are numbers 4, 5 and 6! 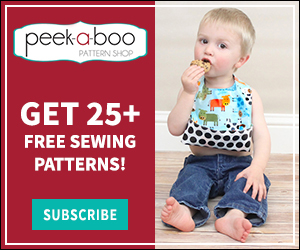 So pick your project (you can check Peek-a-Boo’s patterns, there are several with gathers and ruffles like the Sugar and Spice Dress & Top, the Hailey Ruffled Up Jacket and the Boardwalk Henley, just to name a few), pick your method and go for it! 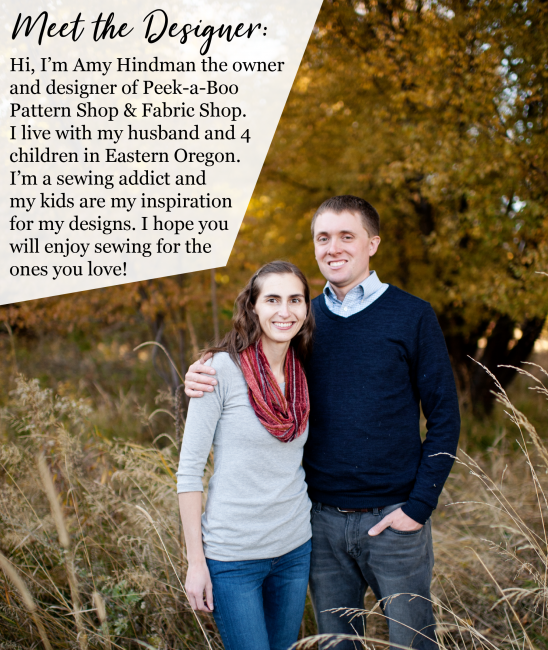 Previous Post: « 2 NEW Women’s Sewing Patterns! thank you … im goung to start again this will help alot i have a 8 yr and a 3 yr old daughter and a grand daughter on the way thank you sooo much .. wld you know wherei cld get freepattern for easy summer dresses of for skirts thanks.. I would add to the serger method that if you up the tension on the two threads you get a tighter gather. You can play with it to get a 3:1 or 2:1 ratio. Pattern Revolution has a great blog post with settings for different popular sergers. Thanks! 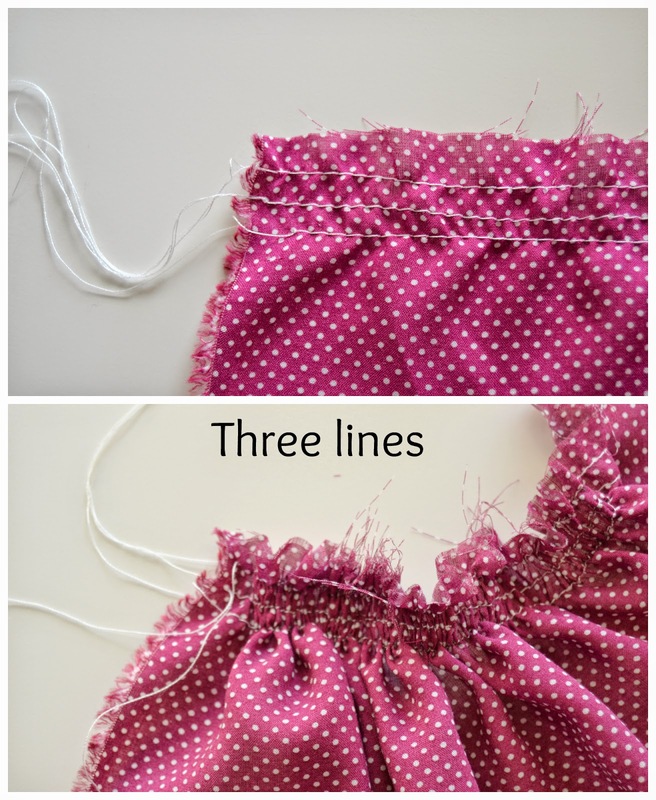 That will be great for anyone wanting to make ruffles with a serger. I have used a ruffler foot to add tulle to the bottom of a skirt. It went quick and easy, which was nice because it was for a wedding. I have some really thick taffeta fabric with no give to it that I am going to try with the ruffler foot, hope it works. Because pulling strings is not working at all. Neither did sewing elastic on or trying to zig zag over a cord. Great round up! I’ve always wondered about ruffler feet….maybe one day! I’ve been spending a lot of quality time with my Ottobre Designs magazines lately and one of the things they always talk about is gathering knits with clear elastic tape. It took me a few tries to get the hang of it but it worked really nicely in the places I’ve tried it. Feels a bit more precise when working with thinner knits especially that can shift? Worth a shot anyway!! The clear elastic method, yes! I could I forget it? 🙂 Although I never used it I have seen it in a couple of patterns. You are right, it is a good method for knits. I didn’t knew that one! Thanks you so much for sharing!